What are Hopeless Teeth ? - Edward M. Feinberg, D.M.D. Edward M. Feinberg, D.M.D. What are Hopeless Teeth ? - Edward M. Feinberg, D.M.D. HomeBlogWhat are Hopeless Teeth ? Many patents are surprised to learn that teeth that have no tooth structure above the gum are far from hopeless! Tooth structure above the gum is actually meaningless–it is the tooth structure below the gum that should determine whether teeth can be saved. Most dentists have been trained to focus only on tooth structure above the gum in order to save teeth. If they do not have enough tooth structure above the gum to retain a restoration, they try to build up the tooth with various materials or with pins and posts. Some try to orthodontically erupt the teeth to move tooth structure above the gum. Today, the trend is to extract these teeth and place implants. However, there is a precision technique for restoring teeth that only requires tooth structure below the gum for restoration. This technique came from the roots of modern dentistry, but is no longer taught in dental schools. No build-ups or potentially destructive posts are required, and the restorations can be worn with Vaseline® without falling out. It is far better to save one’s own tooth if the root is sound than to place an implant. Every Doctor has heard Hippocrates famous saying , “first, do no harm”. 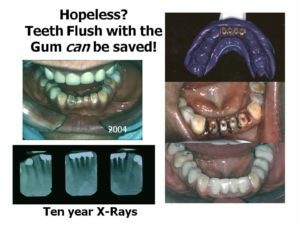 In my view this means, “teeth can always be extracted,” so implant placement should be a last resort rather than a first resort when it comes to dealing with “hopeless” teeth. In truth, no one can predict how long even the most “hopeless” of teeth can last. There have been many instances where teeth condemned as “hopeless” by dental practitioners have lasted in health for many years after corrective treatment—often in spite of diabetes, cancer and heart disease! It never fails to amaze me how long these teeth actually last when all the deformities are corrected. Miracles can happen! Teeth that are truly “hopeless” can be quite useful, as they can facilitate gradual transitions to different types of restorations. Gradual transitions are much kinder to patients than drastic changes. Most patients, for example, have a great deal of difficulty adjusting physically and psychologically to an “immediate” denture—i.e. a denture that is placed in the mouth the day all the teeth are extracted. I never saw one patient yet who did well with this procedure. 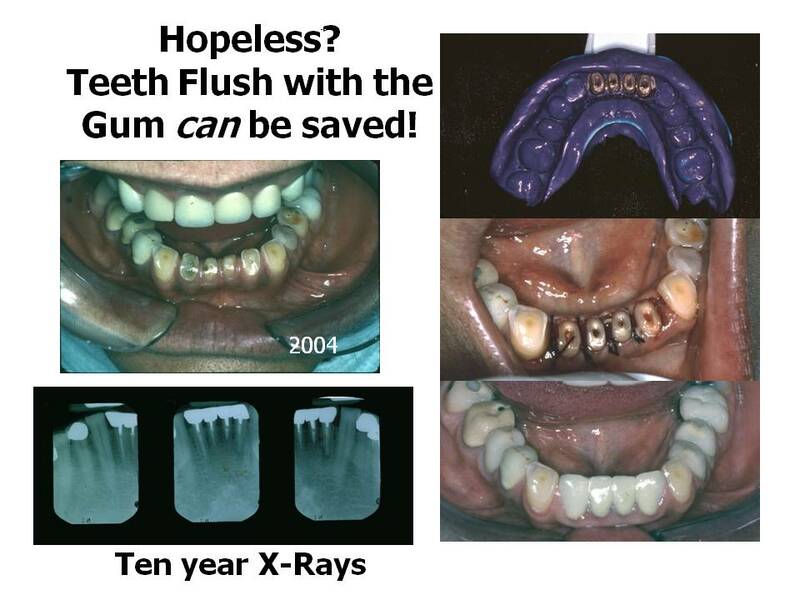 Saving those “hopeless” teeth can provide great comfort and peace of mind to patients by easing such a transition.